Email marketing is still a very important online marketing method. However, as with any type of online marketing you will need to have plenty of content. There are all kinds of content you can create for your email list: tips, Q&As, product recommendations, sales, announcements, and more. 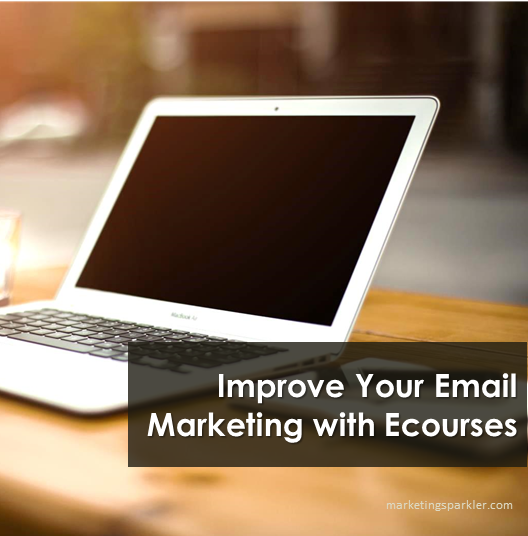 But, if you really want to improve your email marketing consider using an ecourse to get more sign-ups. It’s a great way to come up with interesting, engaging and effective content, and it is a great way to increase interaction. With a well-made email course you can educate your readers about your products and services without seeming like you’re trying to sell to them. For instance, if you market a weight loss product, your ecourse can be about something like “12 weeks to a New You.” Send those who sign up one email per week with tips and tricks for them to do each week so that by the end of the 12th week they’ve created a new healthy habit. Each email also should also recommend a product or two to help them reach their goals, and of course one of the products or services will include your own creations. This works really well if you are a life coach or sell other types of services. Teach your audience what you do, why you do it, and how it can benefit them. Anytime you can find a way to educate your audience it’s a good idea to do it. An email course can be as short or long as you want it to be. You can also include the option for your “students” to email you answers to questions, or to link to a discussion board to discuss each week’s lesson. This is a great way to bring traffic to your website on which you can also recommend more of your products and services. Finding a way to send your ecourse subscribers to your website is always an excellent idea. As with any digital content, your ecourse is not limited to simple text. You can create a text-based ecourse, a video course, or an audio course. Better still is a combination of all three formats will allow for a true interactive experience. You never know how your subscriber will like to learn, so why not give them options? For example, you can create an audio version of each lesson for people who like to listen and learn on the go. Then you can get the audios transcribed and include the text content in the autoresponder emails, with the audio clip attached. And let’s not neglect video! You can record video teasers or full video lessons for those subscribers who prefer video. Tip: If you want to use video, you can upload protected videos on YouTube, so you don’t bog down your site servers. Building an ecourse is simple with an autoresponder like Aweber. Simply create a sign-up form, and place the code on your website. Then, upload an email series so that it goes out on a certain date, such as every seven days, or every Monday at 6pm. If you want to charge for your ecourse you can incorporate it with a membership system if you want, or you can just set up a payment gateway using PayPal very easily. You can create new content yourself or hire someone to create the content for you. If you have any list blog posts, or “how to” blog posts, those also translate well when repurposed as an ecourse. Any content you already have can likely be made into perfect ecourse material. Just be sure not to do a direct copy and paste of any content that is freely available on your site. Make it worth someone handing over their email address. By creating an interactive ecourse that is on autopilot, you’ll get more list member sign-ups, keep them more engaged, and probably make more money from your list in the long run. A person who signs up for an ecourse is expecting a certain amount of email from you, which makes it even easier to market your products and services to them without seeming pushy.